Date of Birth: December 8 of 1986. Age at the start of the series: 29 years. Occupation: Member of the first section of the office of military operations of the tactical departament of military operations in the general headquarters of NERV. Her Range is Mayor, and is the leader of the general headquarters of military operations, on charge of the military orders of the EVAs. Highest Level of Education: The university. 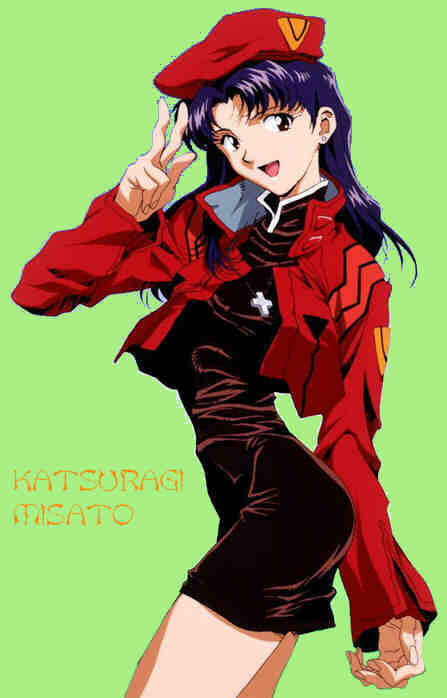 Katsuragi Misato born in December 8 of 1986, being the daughter of one of the scientists who went to an expedition to the north pole, apparently with unknown intencions. Misato went to that expedition. Those scientists, trying to make the second Angel, Adam, back to his embrionary state, accidentaly they activate the power, and that causes the melting of the ice. Misato's dad, put her on a rescue capsule. Her father´s death, affected her mind, and makes her unable to speak by years. In her university years, she knew Akagi Ritsuko, and also Kaji, and he becomes her boyfriend. But, by any reason, the broke up. The crucifix she wears, reminds her her dad. As a Mayor in NERV, she always had a little suspect about Gendou´s actions. Her lover, Kaji, in a night, give her some chips with important information, key information that helps her to know the truth about the humans and the Angels, and the origin of the humans. At the end, she decides to save Shinji, gives him an "Adult" kiss, and her crucifix, and, finally, she dies. Do you want to continue with the INFO? Click HERE!